"You want to make it as some big journalist, you gotta go somewhere crazy." 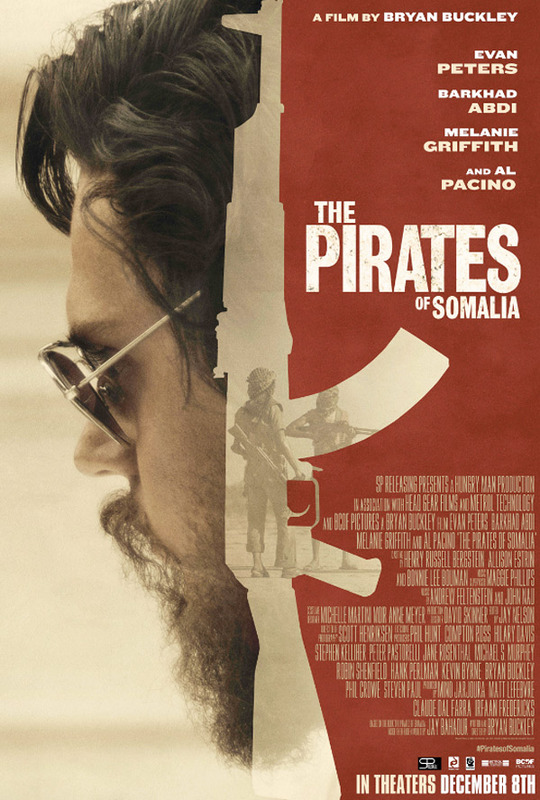 Crystal Sky Entertainment has debuted the first official trailer for an indie dramatic thriller titled The Pirates of Somalia, from writer/director Bryan Buckley (The Bronze). The film tells the "incredible true story" of rookie journalist Jay Bahadur, who in 2008 decided to go to Somalia to embed himself among the pirates there. He ultimately succeeds in providing the first close-up look into who these men are, how they live, and the forces that drive them. Evan Peters stars as journalist Jay Bahadur, and of course they got Somalian native Barkhad Abdi to star as his local fixer. The cast also includes Coral Peña, Philip Ettinger, Russell Posner, Melanie Griffith, and Al Pacino. This actually looks better than expected, so far so good, I am honestly intrigued. When rookie journalist Jay Bahadur (Evan Peters) has an inspiring chance encounter with his idol (Al Pacino), he uproots his life and moves to Somalia looking for the story of a lifetime. Hooking up with a local fixer (Barkhad Abdi), he attempts to embed himself with the local Somali pirates, only to find himself quickly in over his head. The Pirates of Somalia is directed by American filmmaker Bryan Buckley, who made his feature debut with the comedy The Bronze after directing numerous commercials previously. The screenplay is also written by Bryan Buckley, adapted from Jay Bahadur's book "The Pirates of Somalia". This first premiered at the Tribeca Film Festival and it also played at the Austin Film Festival. Crystal Sky will release The Pirates of Somalia in select theaters starting Buckley's December 8th this fall. Interested?